RJC Yacht Sales & Charter is pleased to announce the Sale of the 120' Broward, SONAS! 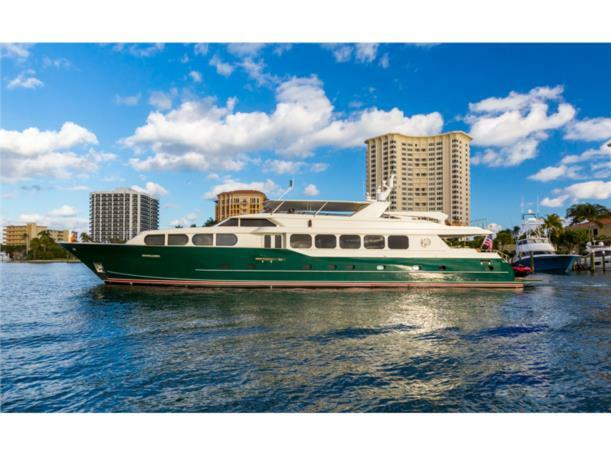 Bob Cury at RJC Yachts Sales is very pleased to announce the sale of the 120′ 2002/2014 Broward MY, SONAS, to a repeat client of his. This vessel represents an exceptional, fully refit, wide-body Broward which features a five stateroom layout including an on-deck master. The 2014 refit included a complete new interior, audio/video, galley appliances, hot tub, teak decks and a TNT Lift. She features all of the large yacht options including a 3500 lb davit making her capable of carrying a large tender, while her flybridge rivals that of a much larger yacht. Powered by reliable 3412 Caterpillar main engines, she cruises comfortable at 14 kts with a top end speed of 18 kts. Her 10,000 gallon fuel capacity allows for extended range. Her new name is SAVIOR-FAIRE and will undergo a complete interior refit and new paint with a white superstructure and Whisper Grey hull. She will be based out of Florida/Bahamas and available for charter in 2017.